Back in the Springtime, I posted a photo of a vintage car parked outside our shop. It really is a beauty and fans on our Facebook page though so too! I later found out it was a 1936 Standard Nine Hp Two Door and is owned by local man, Ian McCloskey. We had been joking with Ian to park it in a better spot the next time so I could get a better photo. Being the kind of guy he is , the next time he drove to the village, he reversed the car nicely in for me to get a good shot. 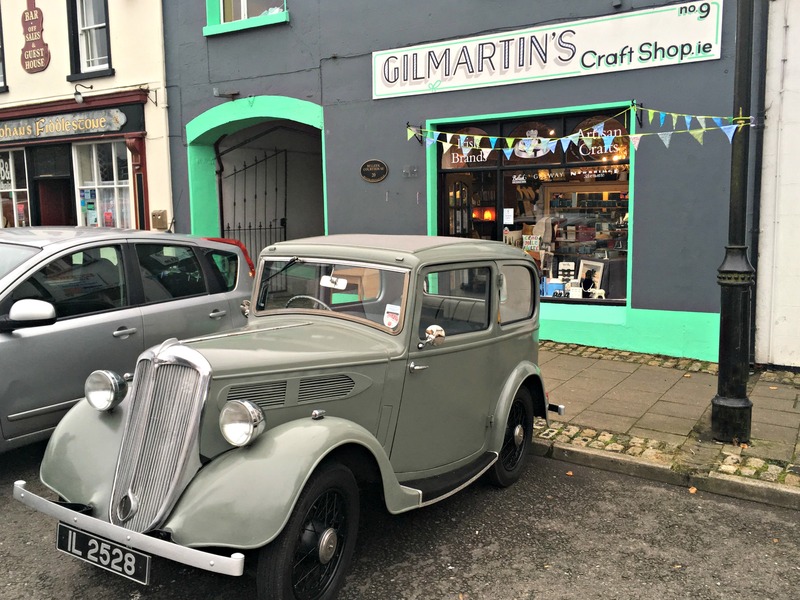 We think this car suits us at Gilmartin’s Craft Shop! Purchased from J Maguire, The Motor House, Darling St / Halls St, Eniskillen. the purchaser was Mr William Sinclair Taylor, Lakemount, Enniskillen, a chemist with a business in Enniskillen. The car was registered is IL 2528 on 26/3/1936. I am not sure how long Mr Taynor kept the car, but in 1941 the car was owned by, but not registered to Mr Danny Magee, an egg dealer and draper of Main Street Garrison. In 1941 there was a shortage of petrol due to wartime rationing and the car was a laid up in stable/carriage house at the rear of Danny’s house. The premises is now owned by Mr and Mrs Peter Ferguson who operate Devenish Villa Holiday Homes. In 1993 Danny passed away and in February 1994 an auction was held to clear the premises of all stock and contents. For the sum of £367.50 I became the owner of Lot 490, mainly a very rusty and dilapidated Standard Nine. A few days later the double garage house doors opened after 53 years and for IL 2528 THE BIG SLEEP was over. The car looked even worse in daylight than it had in the stable. I was able to purchase another car of the same model and year which along with the Standard Motor Club and Ebay I was able to gather suffieient parts to complete a lengthy restoration. 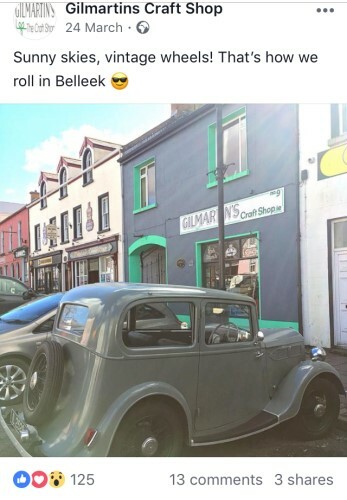 A friend from Belleek, Mr Noel Coyle a former car body shop manager gave up a lot of time and advice, without which the restoration would definitely not have been completed. Mr Baskin Hassard of Enniskillen re-bored the engine, re-cut valve seats, ground valves and flattened off both the cylinder head and top of the engine block. Whilst the crankshaft could have been ground locally, the main and big-end bearings needed re-metaling and then re-boring. Unfortunately this work is no longer done on the Island of Ireland so the complete engine block was sent to JEL BEARINGS of Yorkshire for this to be carried out. The car was rebuilt in 2015 and after a few final adjustment and a cough or two the car was up and running after 74 years asleep. Thank you for giving me a mention in the article The Big Sleep, I was delighted to be involved in restoration of Ian’s Standard 9, mind you it was very nearly as long in lan garage as it was in the shed in Garrison. I was only called in to help when Ian needed a second opinion, for a long time progress was slow and it wasn’t until Ian retired that he had the time needed to get the car back to her original condition, I am delighted to see that Ian uses the Standard to go to Belleek for his morning shopping and the sight of an old car been driving into the village, parking up with the owner hopping out to get his morning paper, very much adds to the ambience of the street and the village. Great story and beautiful car. Maybe I’ll get the chance to see it for real sometime. We would benefit from Noel’s expertise in Lincolnshire! Hello cousin. What a fascinating story and beautiful car. Hope you are all well. Nice to know that a bit of Danny is still about the place. Great story!